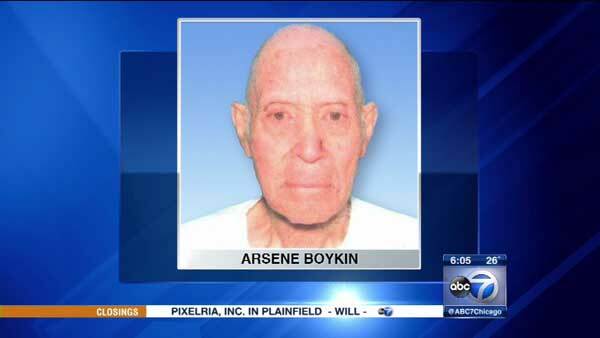 CHICAGO (WLS) -- Police are asking for the public's help to find a 93-year-old man missing from Chicago's Hyde Park neighborhood. Arsene Boykin, who suffers from early signs of dementia, was last seen between 9 a.m. and 10 a.m. Thursday. He was driving his gray 2005 Jeep to get an emissions test. Authorities said he never returned home. Boykin is described as a balding, Caucasian man with blue eyes, brown hair and a light complexion. He is about 5 ft. 8 in. tall and weighs around 165 lbs. His Jeep has an Illinois license plate of BB2L11. Anyone with information regarding Boykin's whereabouts should contact Area Central detectives at (312) 747-8380.